Abstract: A 12 year old Nigerian Dwarf Goat presented for chronic intermittent lameness of the left forelimb of 4 years duration which was diagnosed as nerve entrapment of spinal nerve roots from the caudal cervical to cranial thoracic vertebrae on the left side. 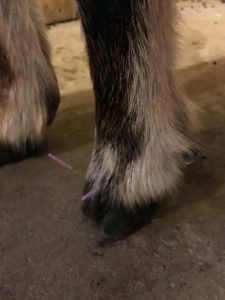 With 4 acupuncture treatments at days 1, 19, 53, and 69 and maintenance acupuncture treatments continuing every 2- 3 weeks (ongoing case), the patient is able to maintain a grade 0/5 lameness score and muscle mass is returning along the left forelimb. 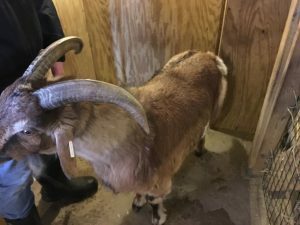 Ernie, a 12 year old male castrated (MC) Nigerian Dwarf Goat, presented for chronic intermittent lameness of the left forelimb of 4 years duration. Each episode of lameness would last from 3 days to 2 months at a time and would recur every few months. Radiographs revealed no skeletal abnormalities. His keepers describe him lifting his left forelimb with increased frequency over the past year. Previous medications given by veterinarians included carprofen, hyaluronic acid, phenylbutazone, meloxicam, and glucosamine/chondroitin which had very little to no observable beneficial effects. There had been no recent changes in diet, environment, or husbandry. Hoof trims were performed bi-annually with no hoof-related lameness issues. His previous history included no other medical concerns. On visual examination, Ernie appeared with grade 1/5 left forelimb lameness and decreased weight bearing of the left forelimb. Visual examination also revealed his dorsal midline hairline marking to be asymmetrically skewed to the side of the affected limb. Myofascial palpation revealed marked muscle atrophy of the deltoideus, triceps brachii, brachiocephalicus, and pars cervicalis mm. (muscles). Tension bands were easily palpated along the brachiocephalicus, cleidocephalicus, sternocephalicus, cleidocervicalis, omotranversarius, and trapezius mm. bilaterally. Tension bands were sensitive to palpation, but joints and bones did not palpate tender to palpation on physical examination. No indications of inflammation or infection were present on examination. Neurological examination revealed no abnormal findings except for occasional infrequent tripping of the left forelimb. Stretching exercises and range of motion exercises revealed decreased range of motion along the caudal cervical vertebrae and the left scapula. The remainder of the physical examination was within normal limits. Given the signalment, history, and physical and myofascial examination findings, acupuncture treatment points were selected to neuromodulate both at the spinal nerve segment roots along the caudal cervical vertebra as well as distally at their branches with focus to the brachial plexus and descending nerves including the suprascapular, axillary, radial, ulnar, and median nerve as well as local myofascial tissue. 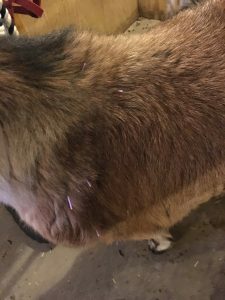 As Ernie was new to acupuncture, we elected to start with a smaller number of acupuncture points at his first appointment and gradually work up to adding more points as he became more accustomed to his acupuncture sessions. The overall goal was to increase bloodflow to the connective tissue, stimulate the spinal nerve roots, decrease myofascial tension and release trigger points within the surrounding myofascial, and to assess response to acupuncture. Radiographs revealed no skeletal abnormalities in the distal forelimb or evidence of laminitis, though arthritis of the proximal forelimb could not be fully ruled out due to limitations of film radiography. Clinical findings place CAE as a very low differential, as no joint capsule distention has every been observed, the affected joint(s) do not match clinical manifestation of CAE, and the clinical course of CAE is always progressive with neurological signs. Copper deficiency was ruled out as the copper status of the ration needs is adequate with supplementation provided as necessary as well as the lack of evidence of abnormal bone growth with increased bone fragility. With no apparent musculoskeletal abnormalities aside from secondary muscular diffuse atrophy, clinical assessment of nerve impingement was placed as most likely differential diagnosis. Over the course of his treatments, Ernie responded well to his acupuncture and would maintain a grade 0/5 lameness up to 3 weeks after acupuncture, at which point he would return to grade 1/5 lameness. This also helped confirm response of the nervous system to treatment. (Day 53), and 2/7/18 (Day 69). With acupuncture performed once every 2 weeks, Ernie maintains full comfort with resolution of clinical signs and grade 0/5 lameness. His keepers have observed him to have more energy and be more playful and outgoing. 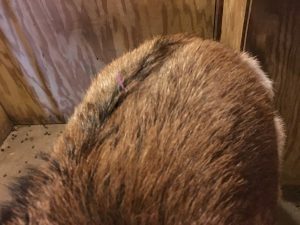 His tension bands have decreased in number and in tautness between treatments, and his muscle tissue is beginning to recover from diffuse atrophy at a slow, but gradual pace. 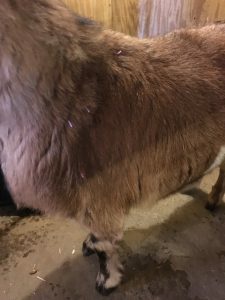 With maintenance acupuncture treatments every 2-3 weeks, Ernie has been removed from all medications and supplements and maintains a grade 0/5 lameness with no more lifting of the leg. He has improved and continues to improve with acupuncture alone. No adverse effects were noted during any acupuncture sessions and the zookeepers remark that Ernie has responded better to acupuncture alone than to any medication or supplements given in the past alone or in combination. For future acupuncture sessions, I believe that Ernie would benefit from Electro-acupuncture as well, which I would like to use in future sessions.